Our contest is now over. Congrats to Erica Weaver!! Looking for AWESOME yet affordable jewelry? Visit our friends at Robert Manse Designs. Feeling lucky? 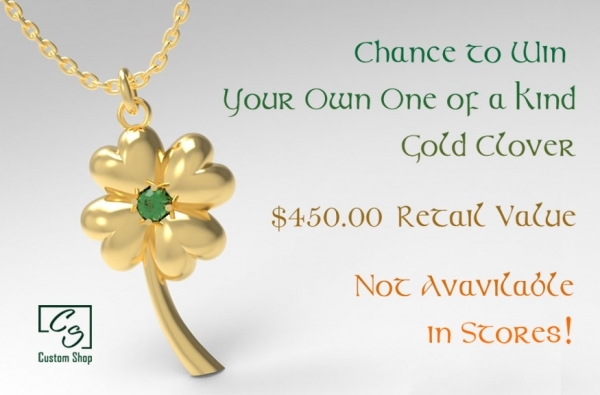 Here’s a chance to win your very own gold four leaf clover - just in time for St. Patrick’s Day! Specially created by Custom Shop, this one-of-a-kind pendant is set with a beautiful green Tsavorite garnet, and dangles from a 18 inch gold-plated chain. Delivery will be before March 17th, so you can show off your Irish! Not available in stores. Approximate retail value - $450. Enter today. Your chance to win a one-of-a-kind gold four leaf clover ends March 12, 2018. No purchase necessary. Must be 19 or older and a United States resident. See official contest rules below for more information.